Regulatory Signs by Street Sign USA! 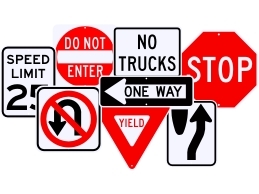 Regulatory signs are the perfect choice for directing and controlling vehicular traffic. Inform drivers where to stop, yield and turn. Guide them in the proper direction and tell them at what speed to travel. Optimum reflective performance of 7-12 years & more!